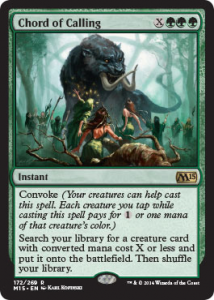 The Magic 2015 Core Set is considerably different from other core sets of previous years. Fonts have been changed, the border has been streamlined, and a foil oval adorns any card at the Rare or Mythic Rare levels. A number of new cards have been released, including a set of guest-created cards. 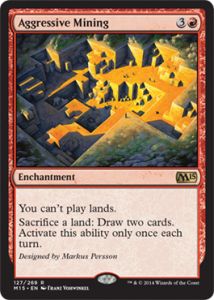 Aggressive Mining, created by Notch from Minecraft stops players from playing lands, but allows them the opportunity to sacrifice a land to draw two cards while Plants vs. Zombies’ George Fan has created Genesis Hydra, a green creature that allows players to pay additional mana to be given the chance to play an additional card from the top of their library. Planeswalkers return in Magic 2015, including previously printed efforts (Liliana Vess) and new planeswalkers (Ajani Steadfast, which can provide considerable buffs to creatures, planeswalkers, or decrease the overall amount of incoming damage to players and planeswalkers). 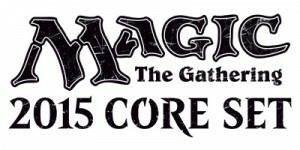 While previous core sets have not had specific geographical distinctions, Magic 2015 proudly shows off the planes where players have previously been in a “Soul of” cycle. The Soul of Ravnica is a 6/6 flyer that allows players to draw a card for each color among permanents you control, while the Soul of Zendikar creates 3/3 Beast tokens with the expenditure of some mana. There is considerable support for a variety of tribes in Magic 2015, with the Goblin Kaboomist providing players with the opportunity to blow up attacking creatures (or the catastrophe of taking out the Kaboomist itself) and the Preeminent Captain allowing players to bring out other Soldiers whenever the captain attacks. Make sure to visit your local game store (LGS) for any hosted events (Friday Night Magic) and to purchase packs of Magic 2015.